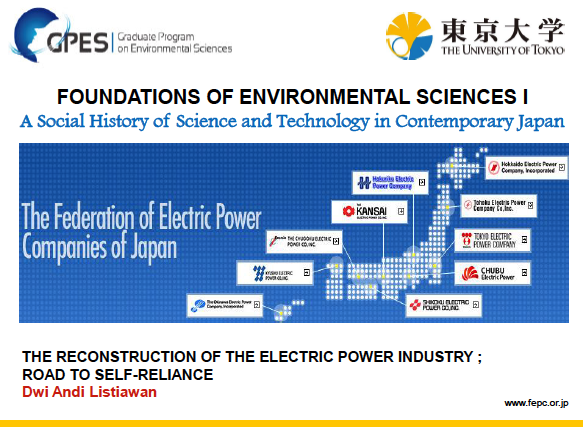 Today I want to draw your attention towards the amazing presentations that fellow GPES member Andi presented in the cause of the “Foundations of Environmental Sciences I” class in October as well as November 2014. His presentations are summaries of book chapters, each time complemented with own additions and information. 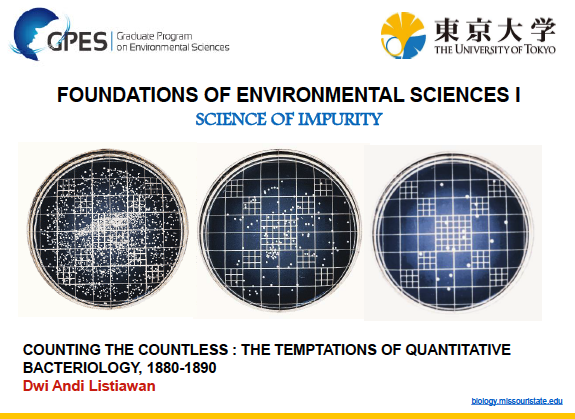 He kindly agreed to make them available (therefore please do not reproduce or distribute without his permission) so that everyone can get and impression on both the evolution of water purity analysis in this “COUNTING THE COUNTLESS : THE TEMPTATIONS OF QUANTITATIVE BACTERIOLOGY, 1880-1890″ presentation as well being able to find a brief outline on the basic structure of the Japanese electricity in post-WWII Japan under American occupation in his “THE RECONSTRUCTION OF THE ELECTRIC POWER INDUSTRY: ROAD TO SELF-RELIANCE” presentation.